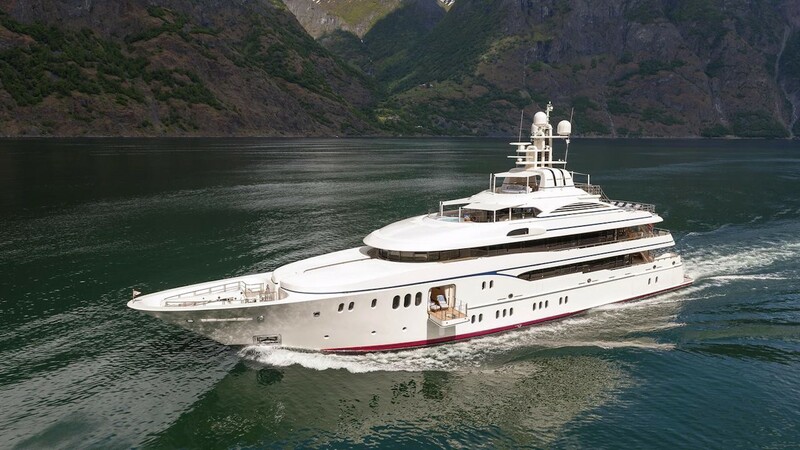 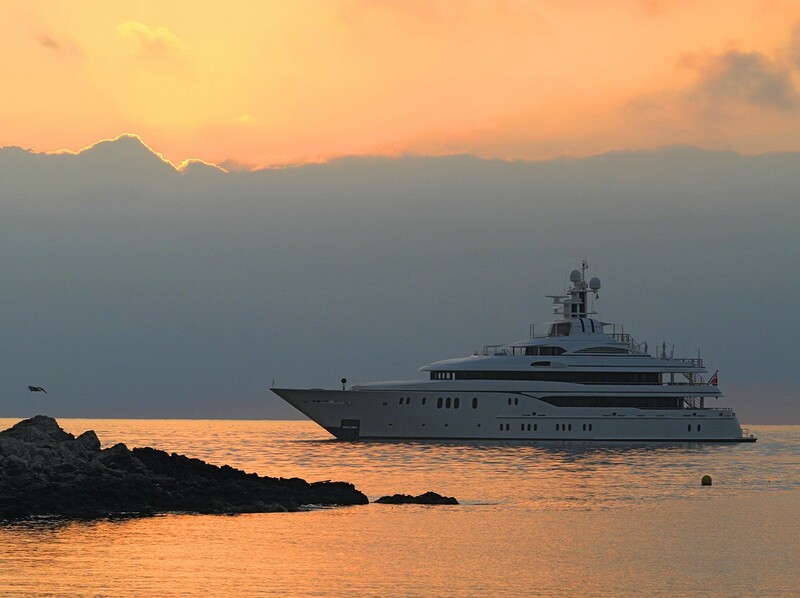 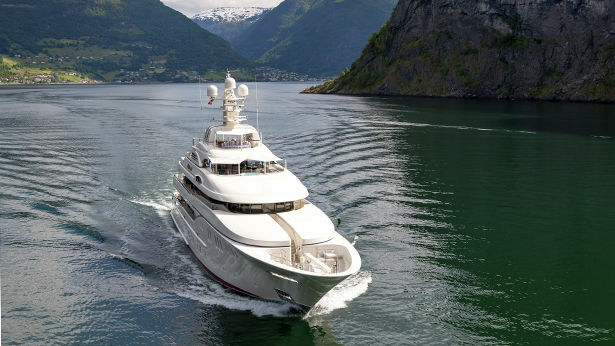 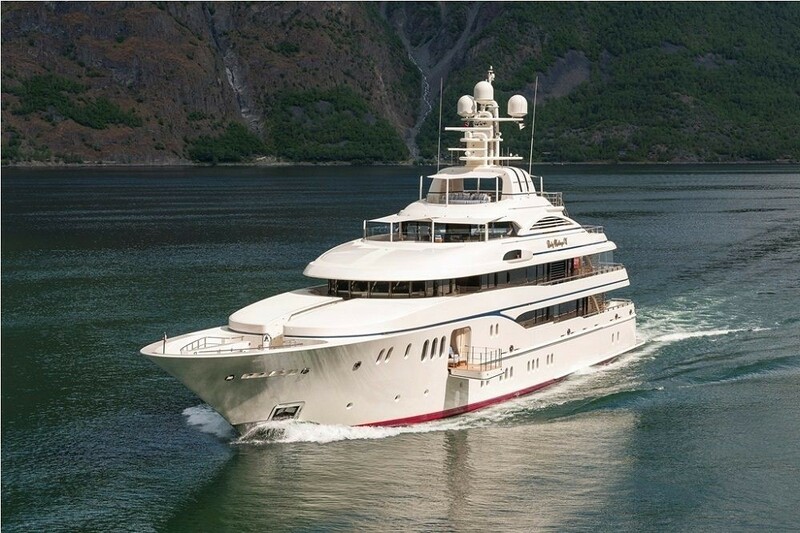 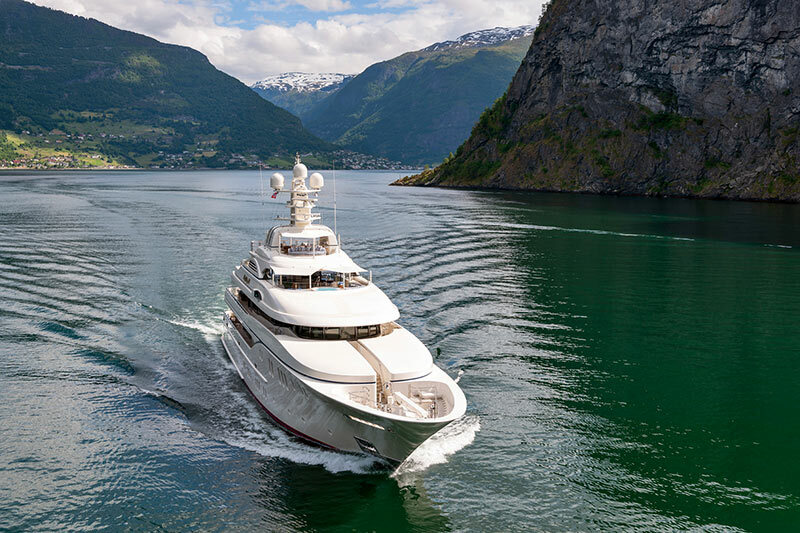 Constructed in 2011, this 61m/200ft FULL CUSTOM superyacht from Lurssen has retained her appeal with timeless interiors from Adam Lay & Jack Phillips as well as an exterior stylist from the multi-award-winning Espen Oeino, who also completed her naval architecture. 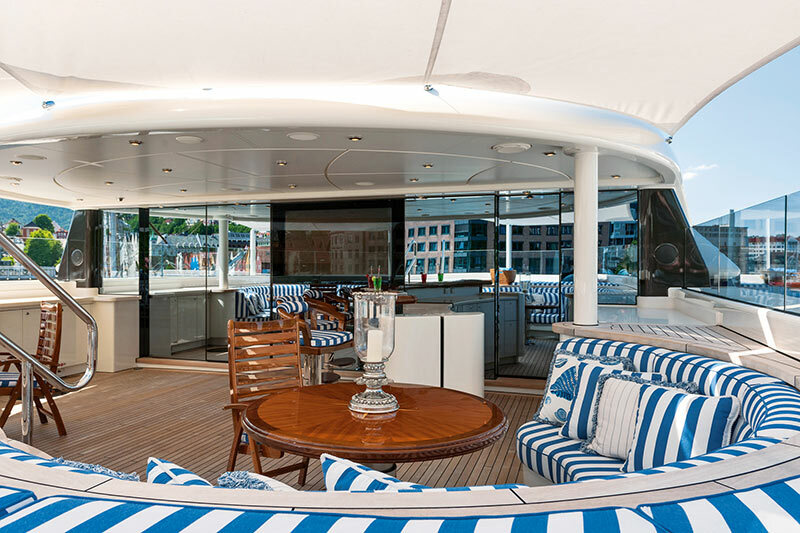 Boasting a sauna and steam room on the sun deck in addition to cutting-edge audiovisual technology, a dance room and an abundance of dining options, this yacht is a magnificent charter choice designed to serve 12 guests across six lavish en-suite cabins, with a crew of 15 for effortless travel. 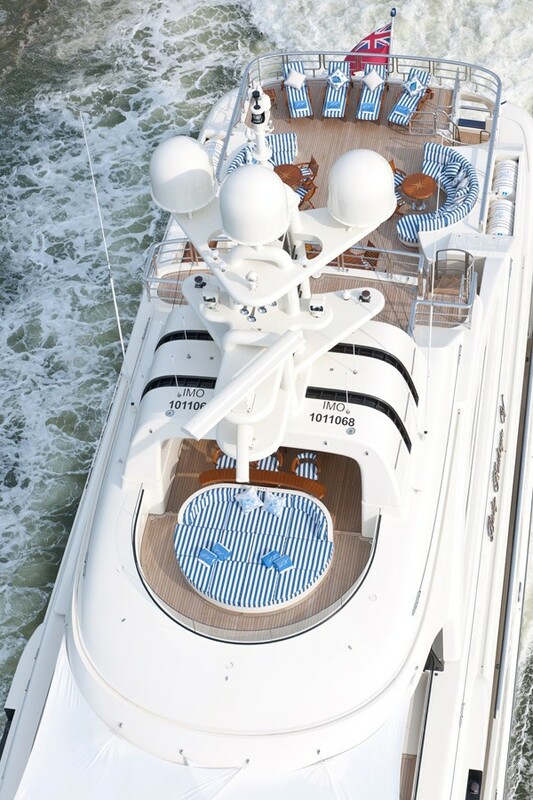 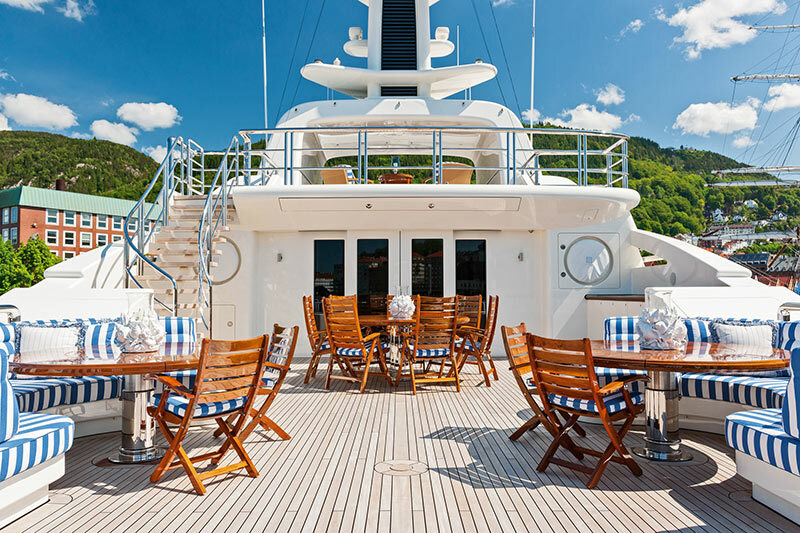 The lower deck swim platform joins to the main deck aft, which has a large curving sofa integrated into the stern and a massive oval dining table and additional chairs for elegant alfresco dining. 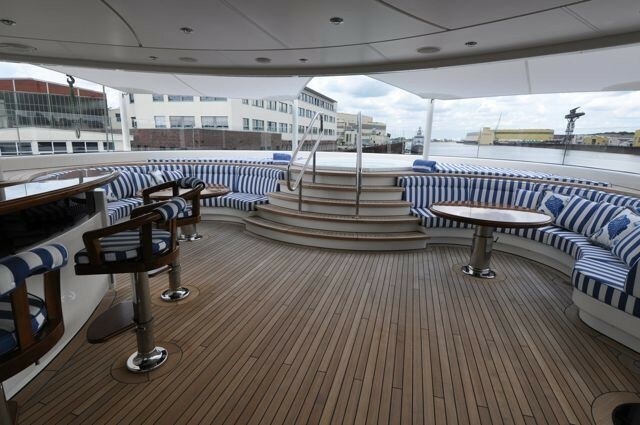 The foredeck also has two curving sofas around the gunwales, leaving the central area clear for a Davit crane and for storing the tender. 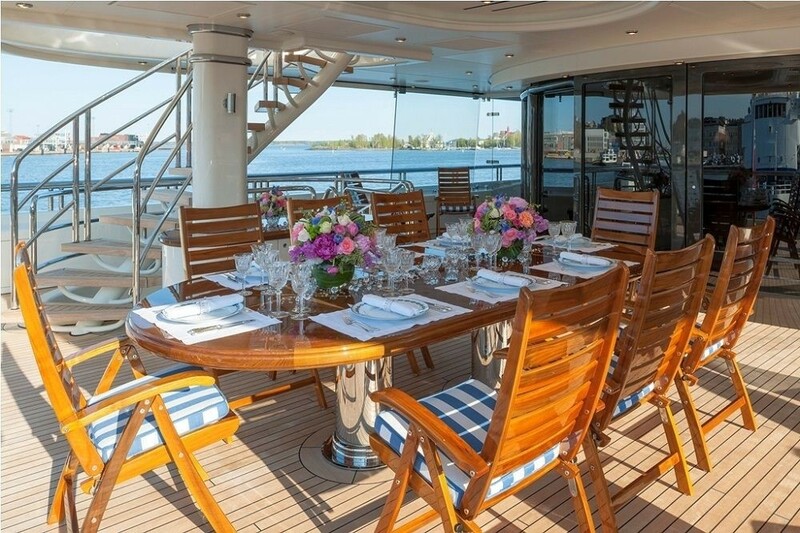 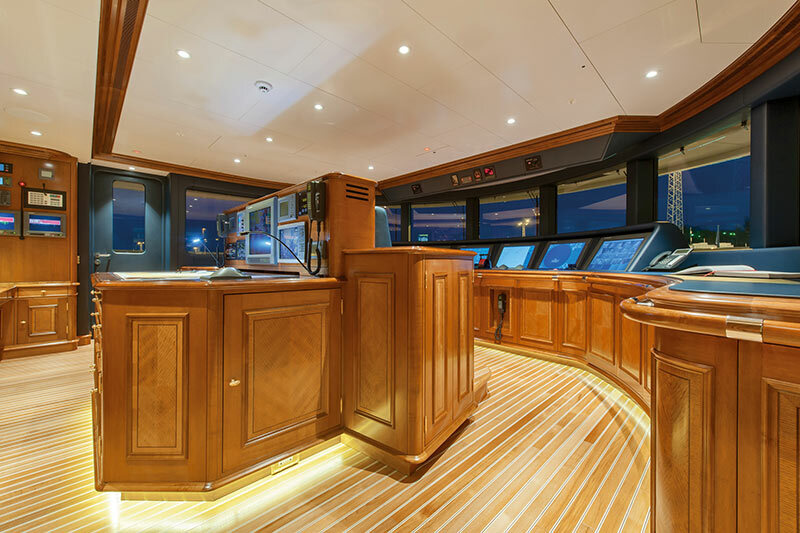 The bridge deck aft is furnished with a wet bar, a large alfresco dining table and seating along the stern for watching the sunset after an evening meal. 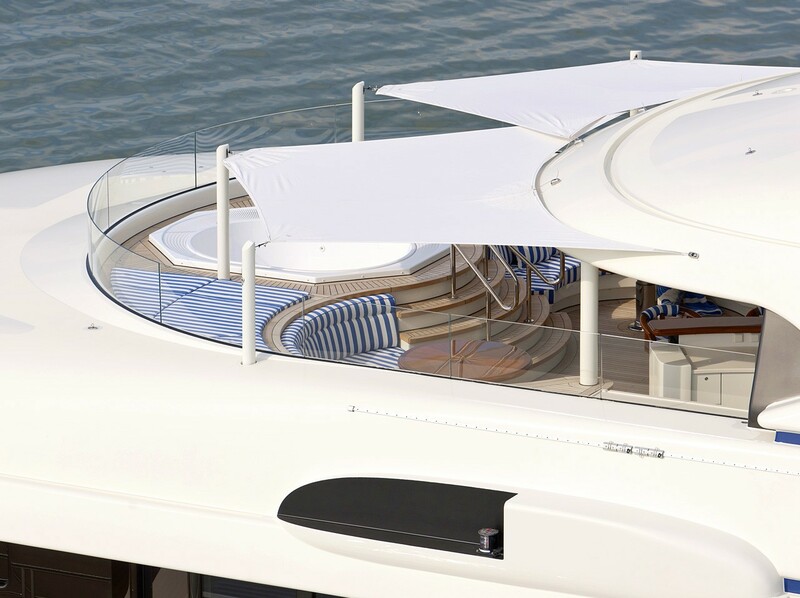 On the sundeck, there is a more intimate dining setting with circular seating around a drinks table to port and starboard. The aft is lined with sun loungers whereas the sundeck forward has a raised Jacuzzi tub surrounded by sun pads, with circular drinks settings on both sides and a wet bar behind. 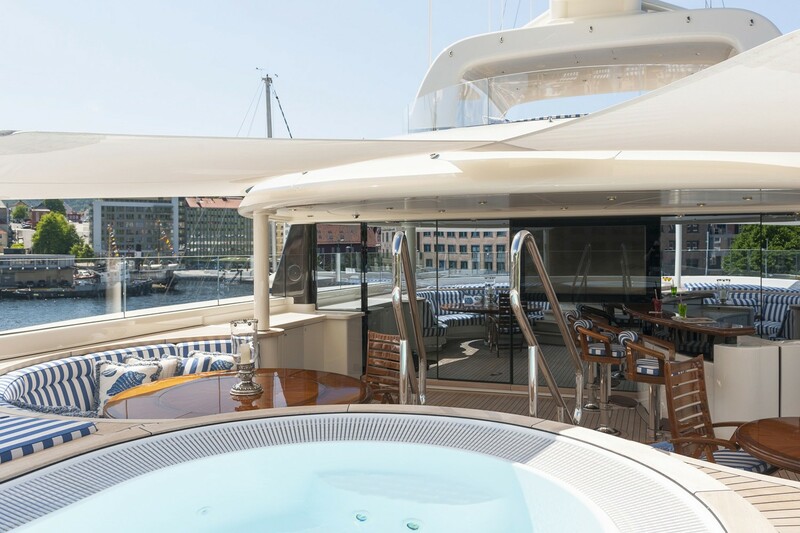 A final sunbathing space can be found up on the top deck, which has a sunbed forward and aft of the communications mast. 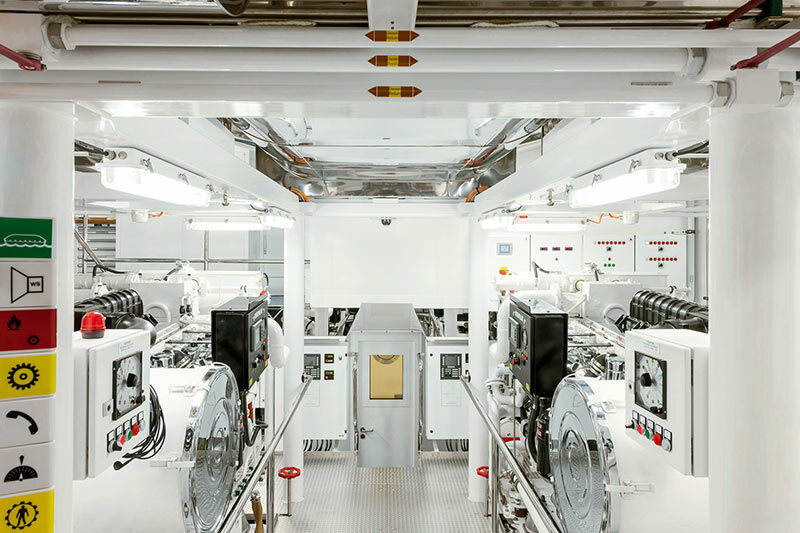 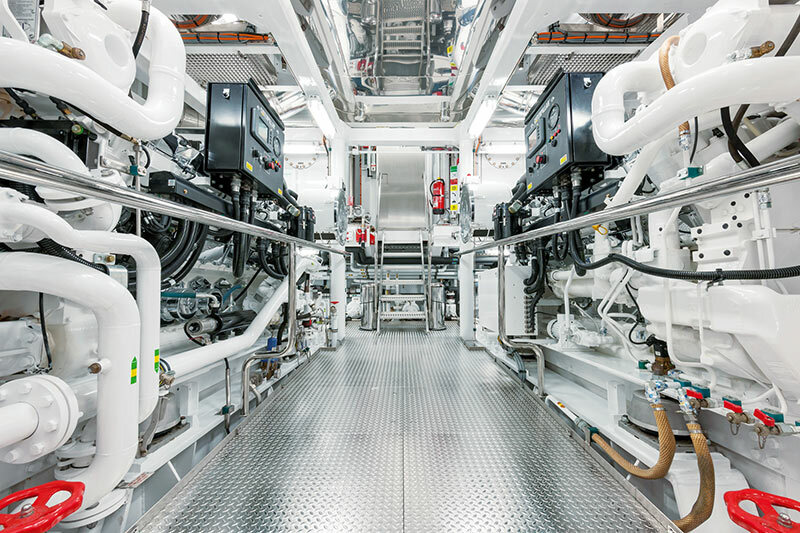 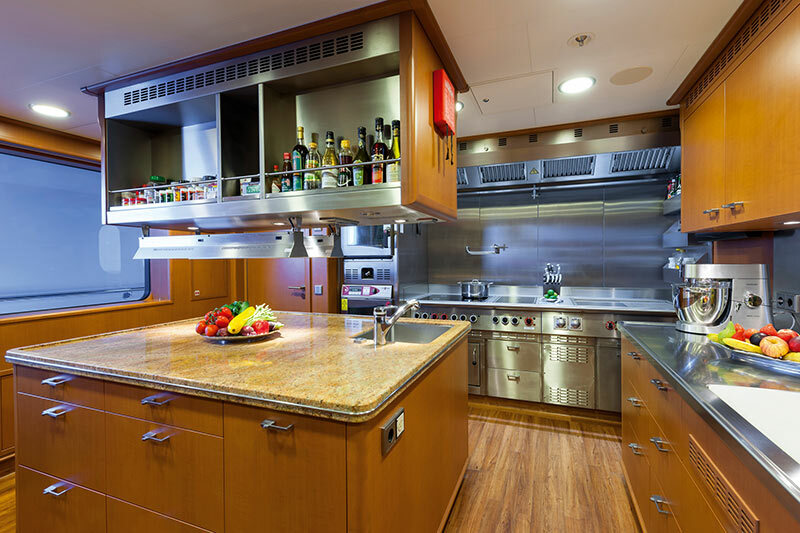 The lower deck places the crew accommodation, galley ad amenities forward with four of the guest cabins immediately behind. 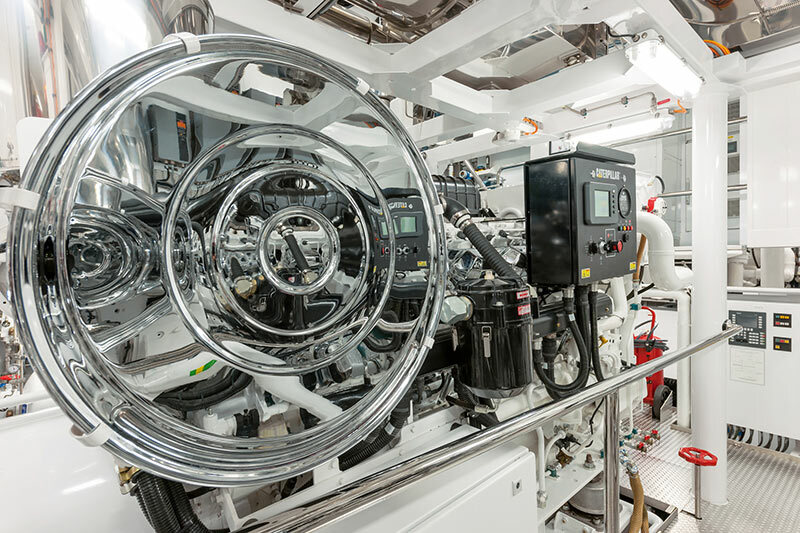 The engine room is farther aft with the voluminous tender garage in the stern. 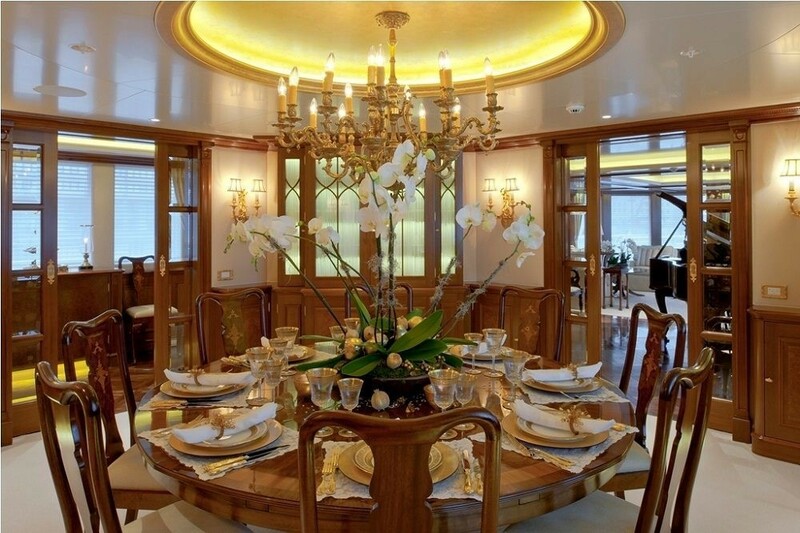 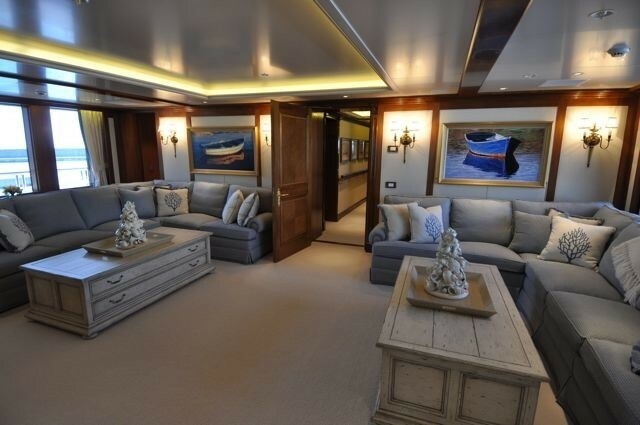 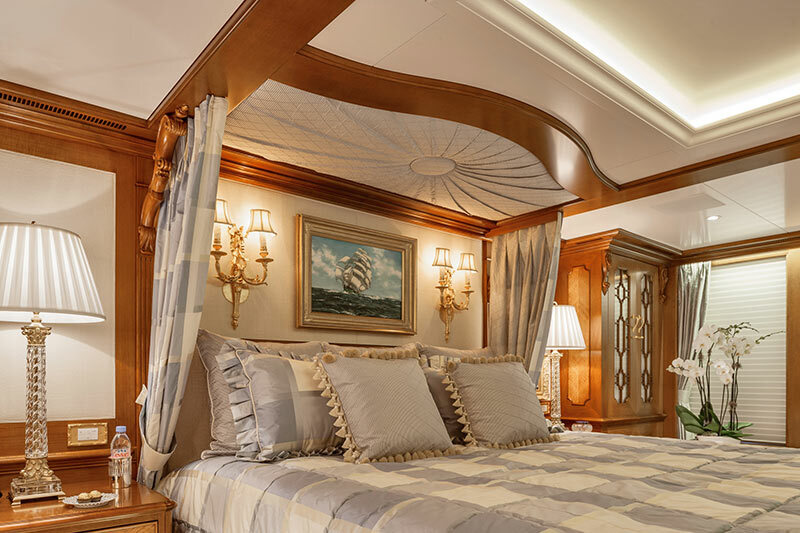 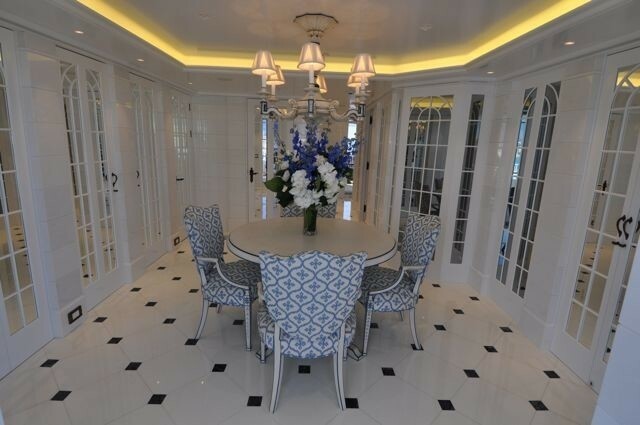 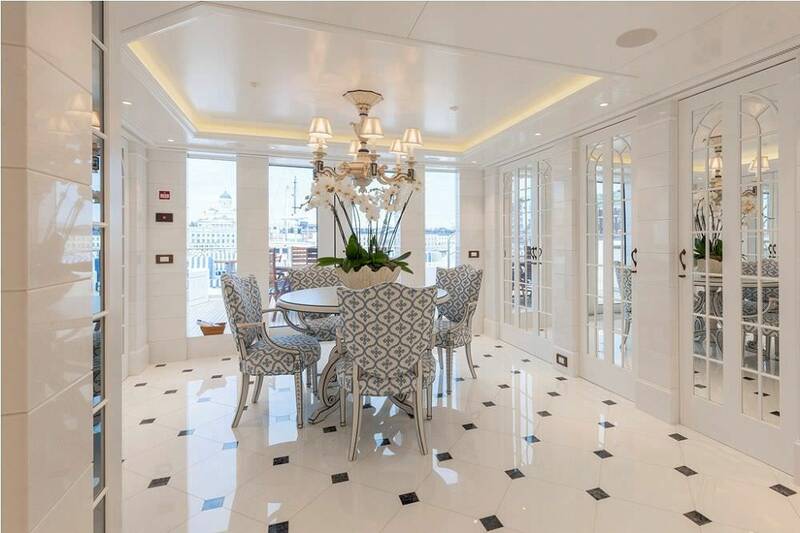 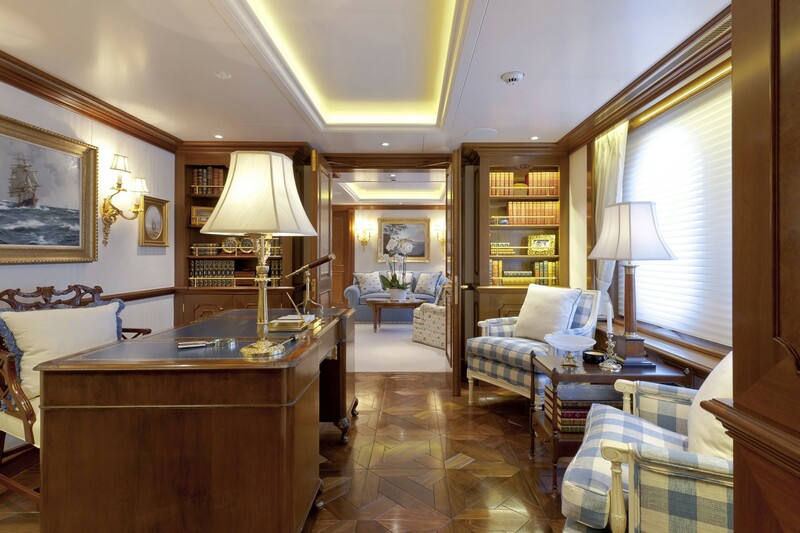 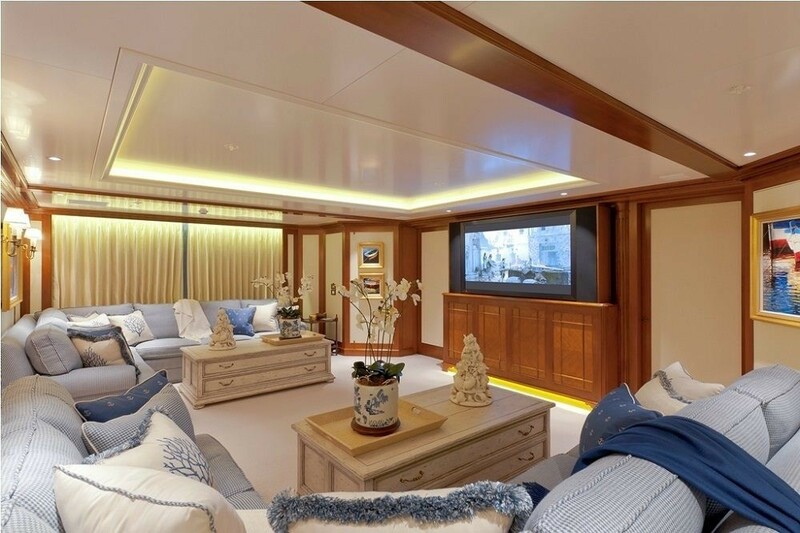 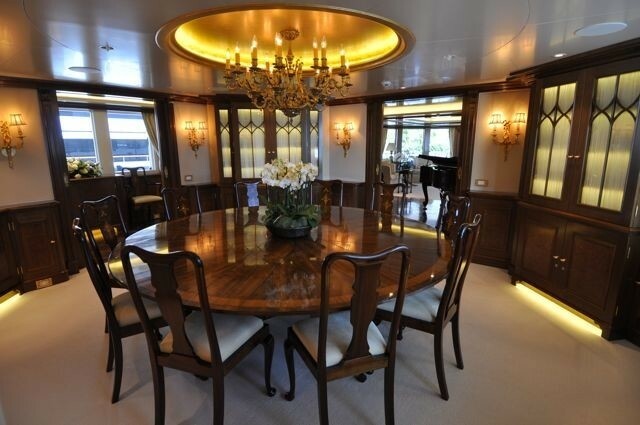 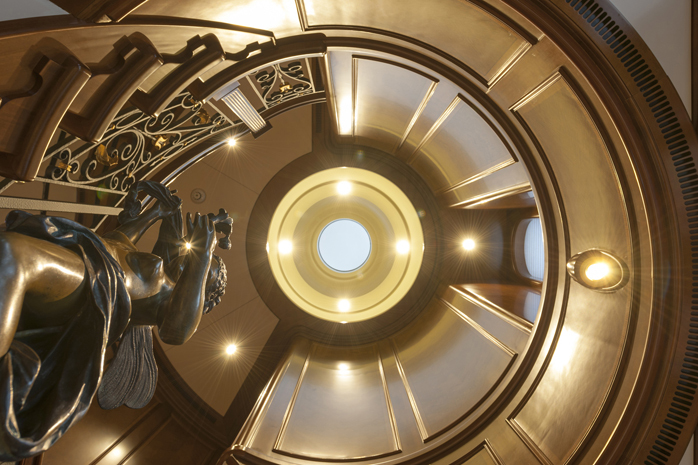 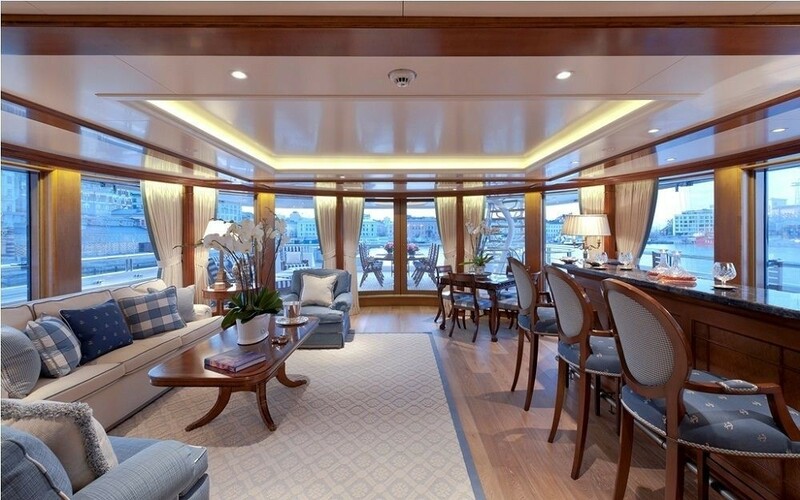 On the main deck the full-beam forward Master suite can be accessed via the office forward of the main foyer, and to the aft, the main salon has a separate formal dining area able to seat up to 12 guests around a lavish circular table. 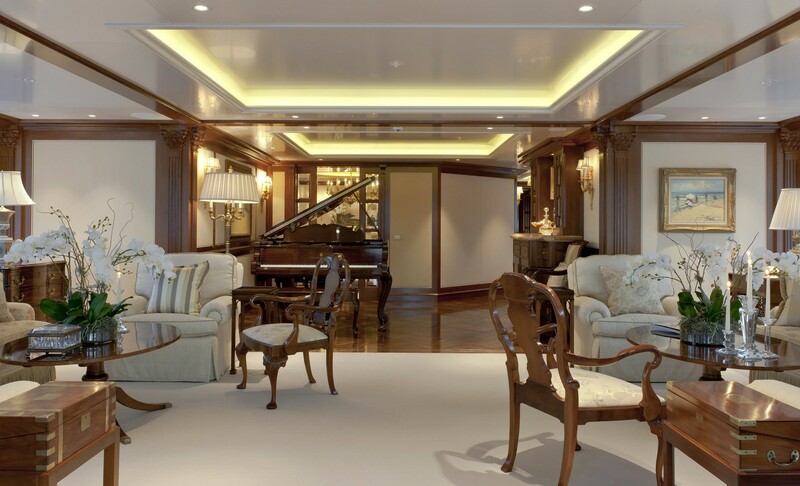 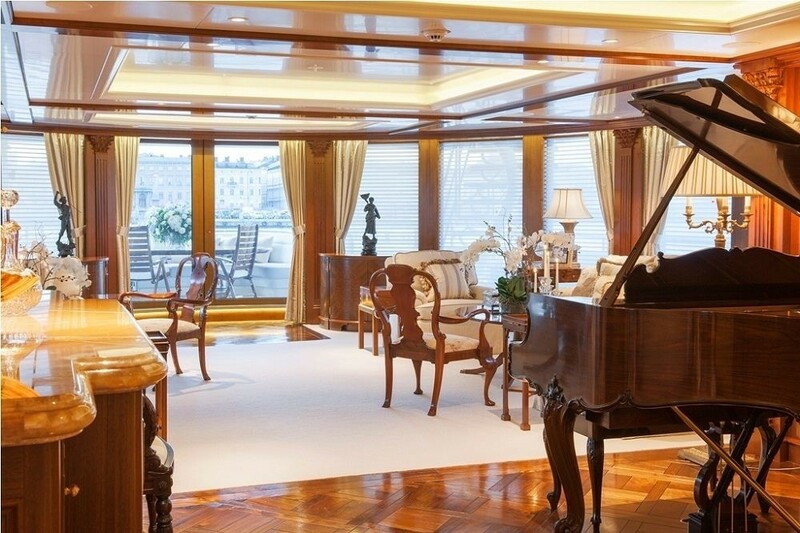 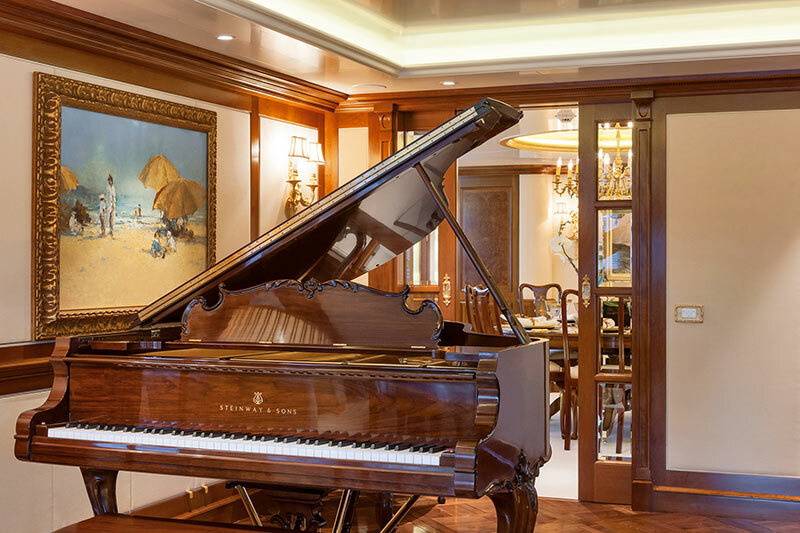 To the aft, a grand piano to the port side will entertain visitors during a lavish dockside party, and sofas and armchairs on both sides of the room are paired with coffee tables and side tables for relaxation and ambient lighting to suit the time of day. 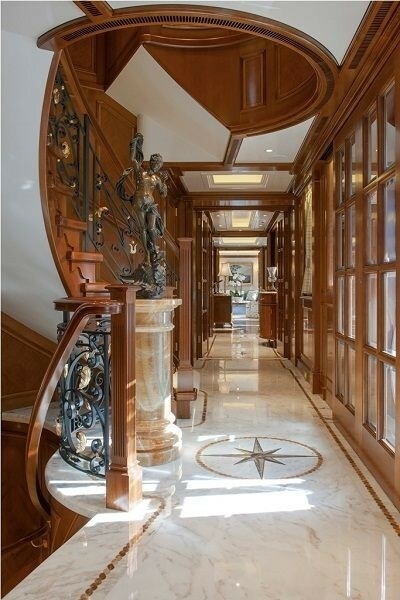 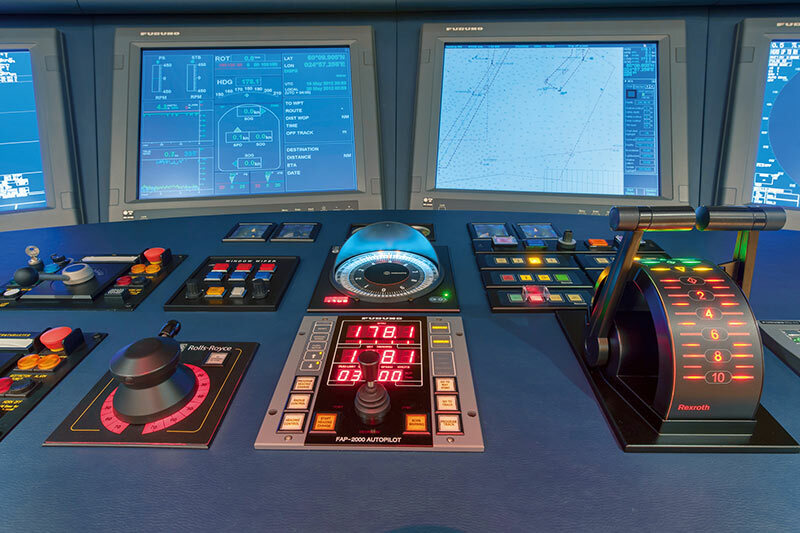 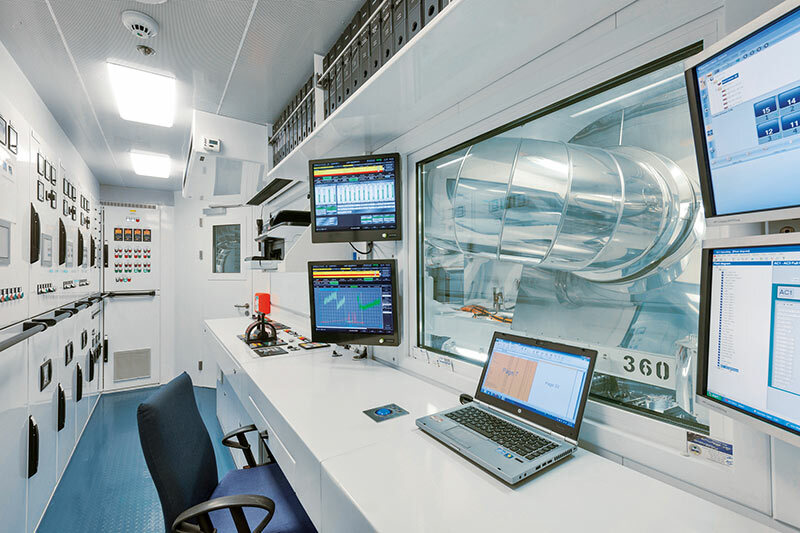 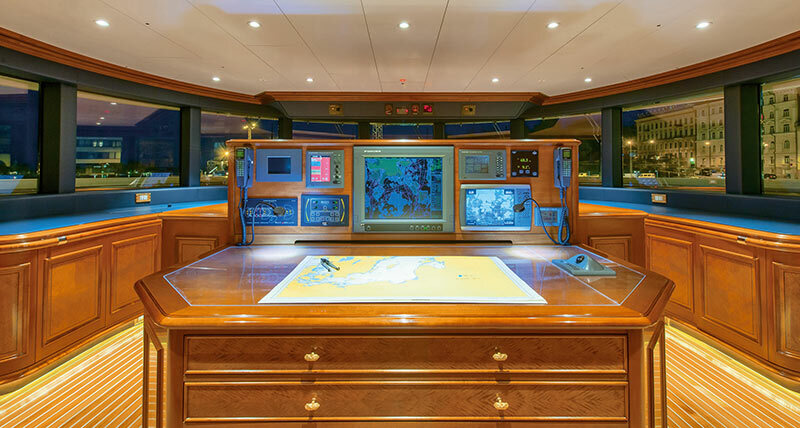 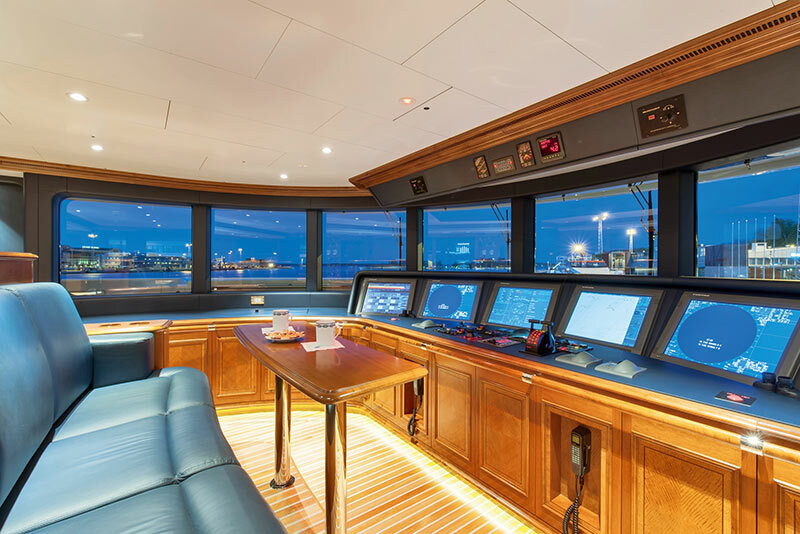 The bridge deck places the helm station forward and the captain's cabin behind to starboard, opposite of which is the VIP guest cabin with adjoining bathroom. 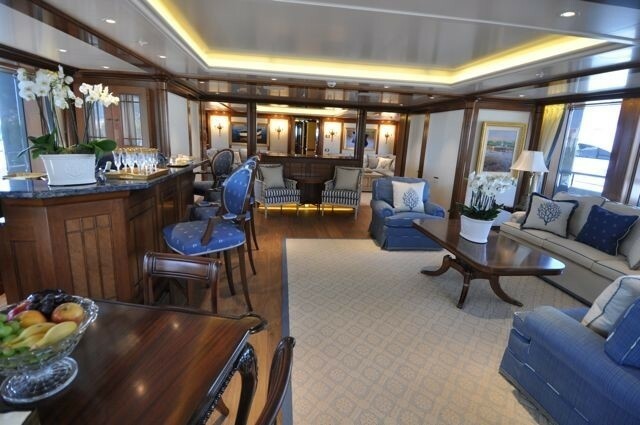 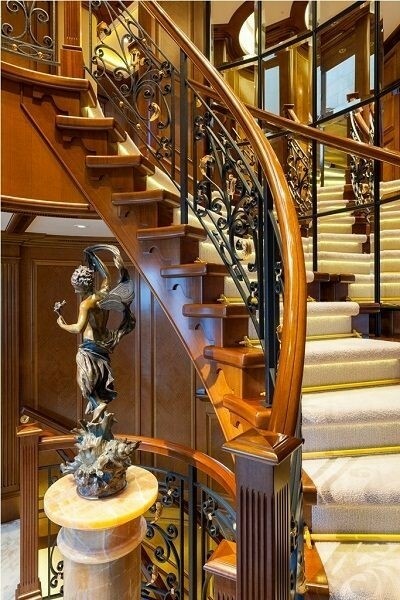 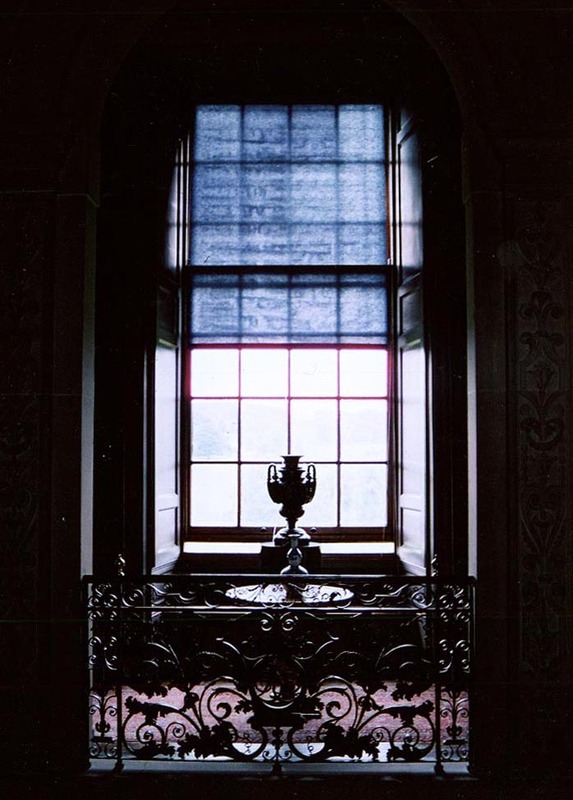 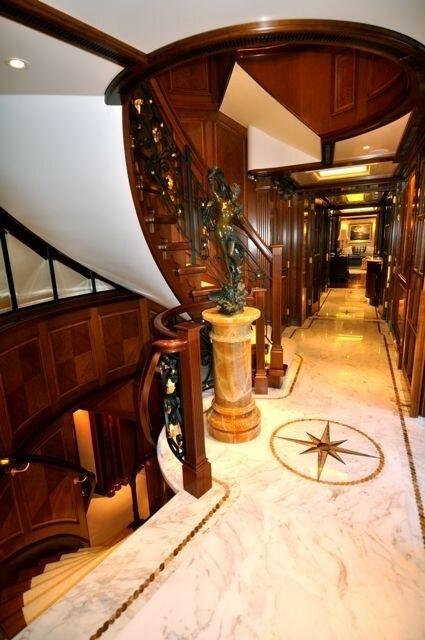 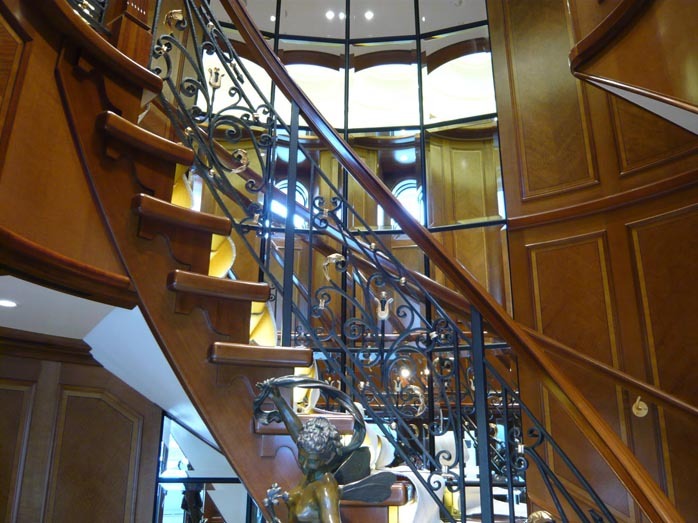 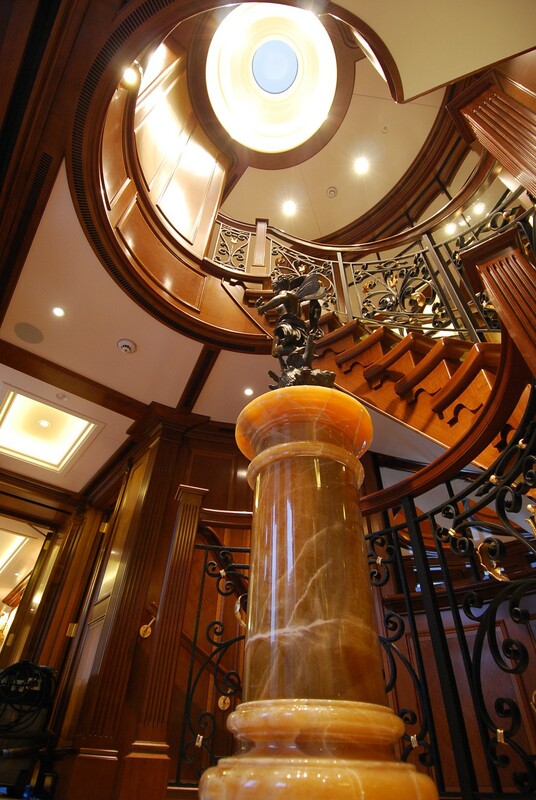 The dance room to the aft has a spiral staircase up to the sundeck lounge, a wet bar to the aft and a large sofa, coffee table and additional chairs beside the port windows. 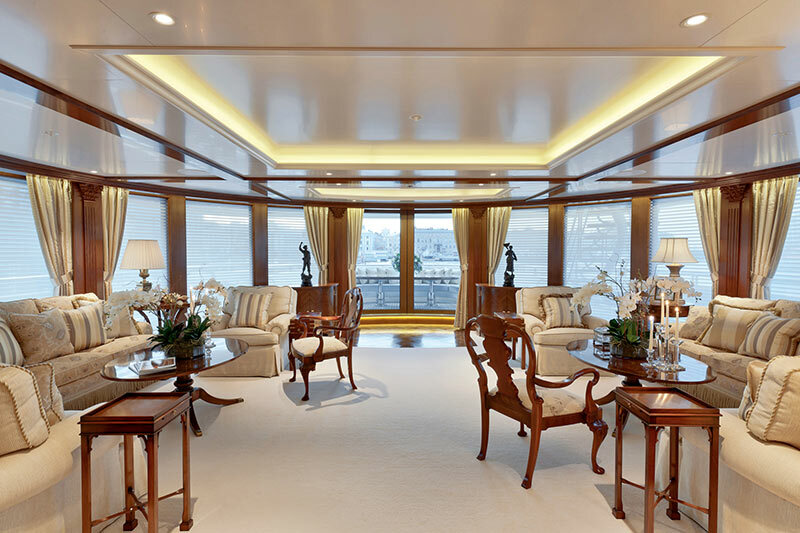 A final lounge with floor-to-ceiling windows and glass sliding doors is aft of the dance room. 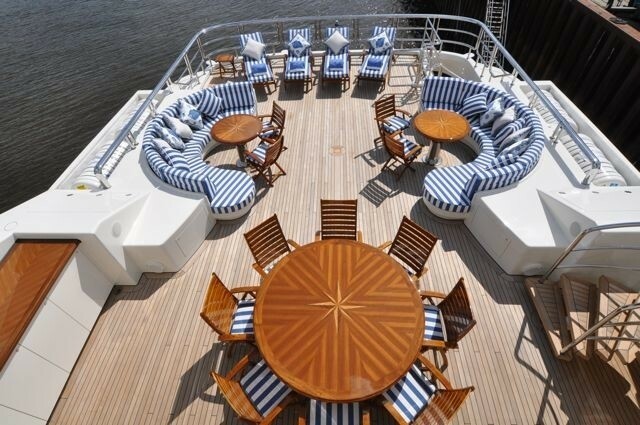 The symmetrical layout seats all 12 guests in comfort after an alfresco meal. 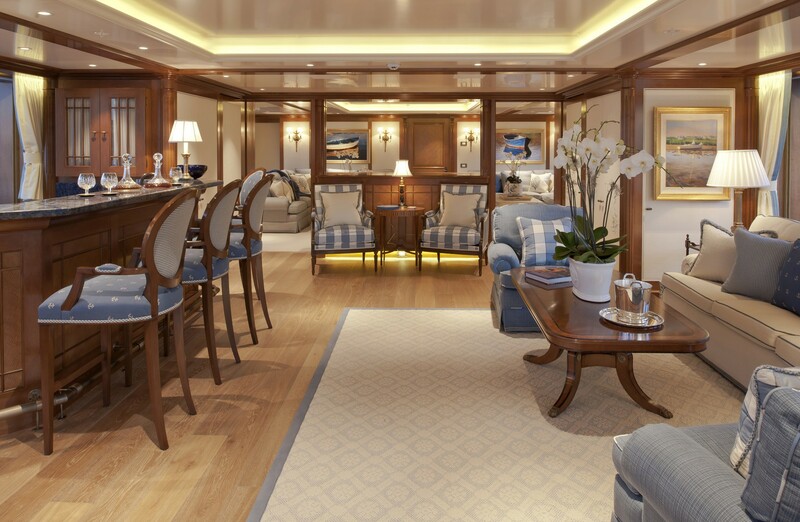 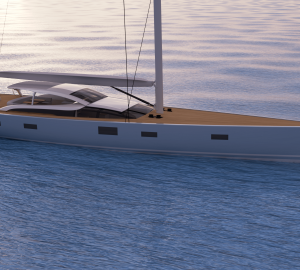 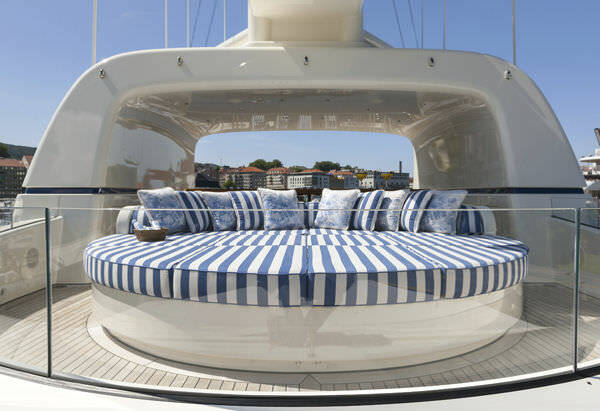 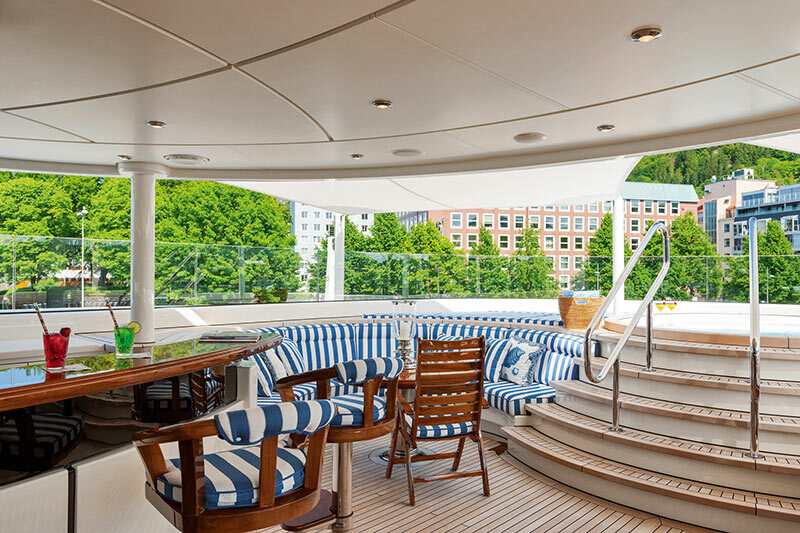 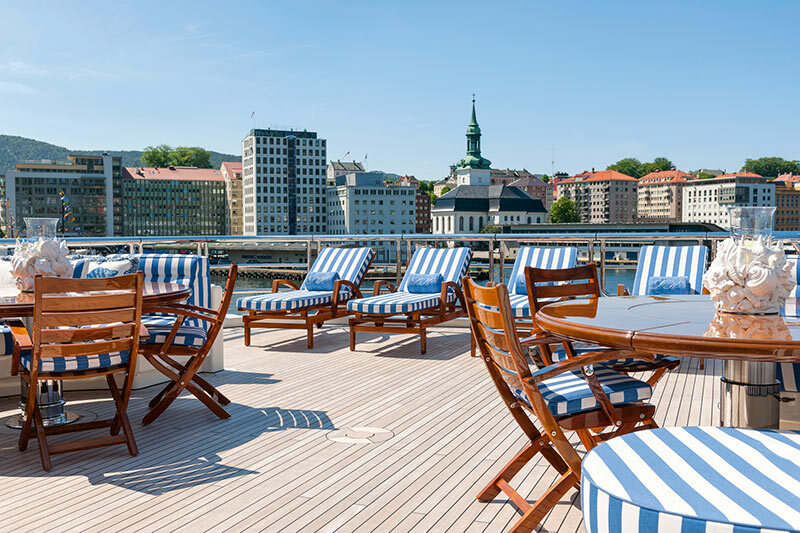 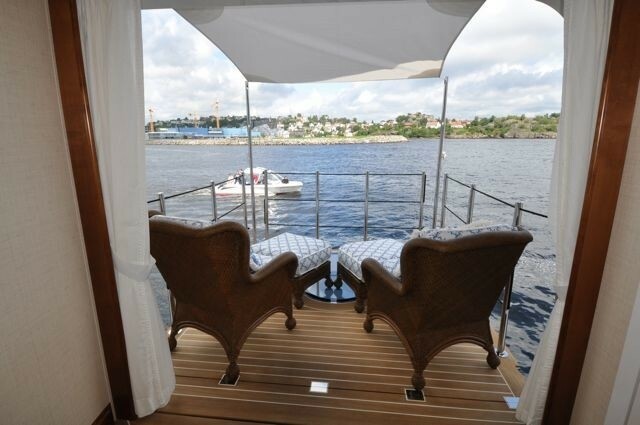 The sundeck lounge is located amidships and is fitted with plenty of seating, including an integrated L-shaped sofa curving along the forward wall, a formal dining area consisting of a circular table and chairs, plus another lounge to the aft. 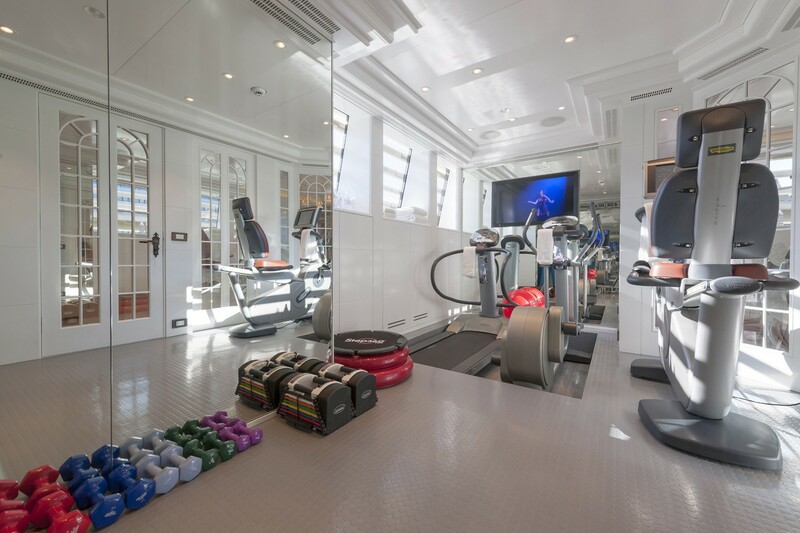 An extensive gym is placed to starboard that is fitted with a widescreen TV and a floor-to-ceiling mirror while also enjoying the elevated views and after workouts, there is a sauna and steam room to relax tired muscles. 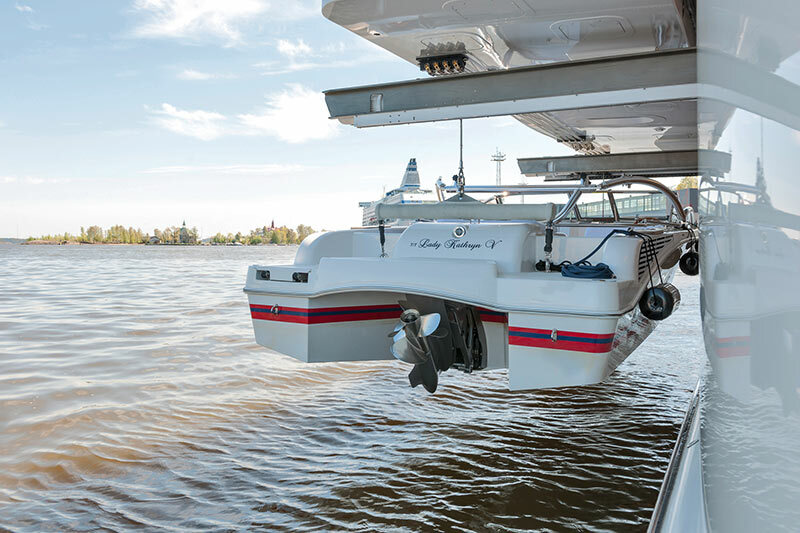 Twin Caterpillar 3512b mains engines and 3 x Caterpillar C18 gensets create a top speed of 15 knots with a cruising speed of 12.5 knots and a range of 5,000 nautical miles. 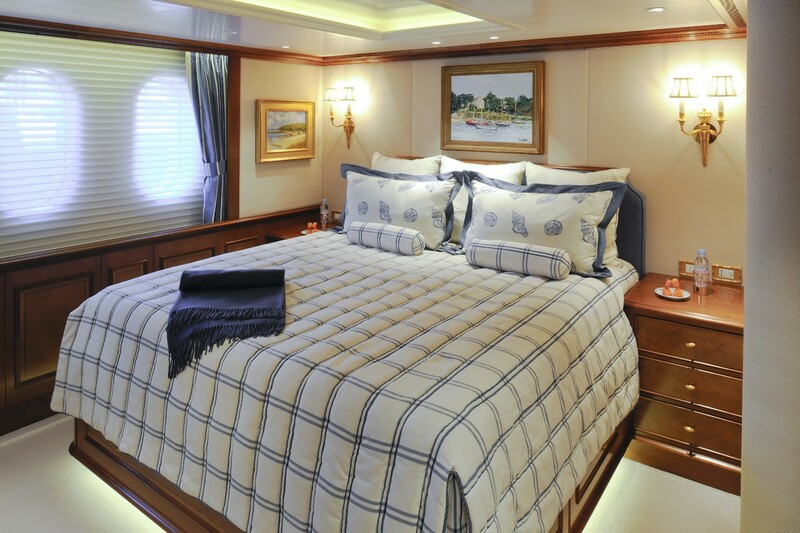 The accommodation sleeps a maximum of 12 guests over 6 en-suite cabins: 1 Master suite, 1 VIP stateroom and 4 double cabins. 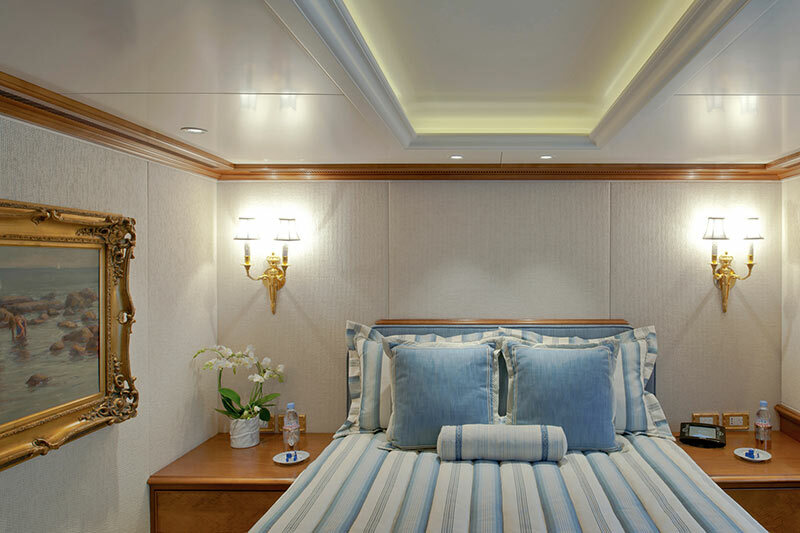 The Master suite is placed upon the main deck forward and is accessed via the Master corridor and office, which contains a desk and sofa. 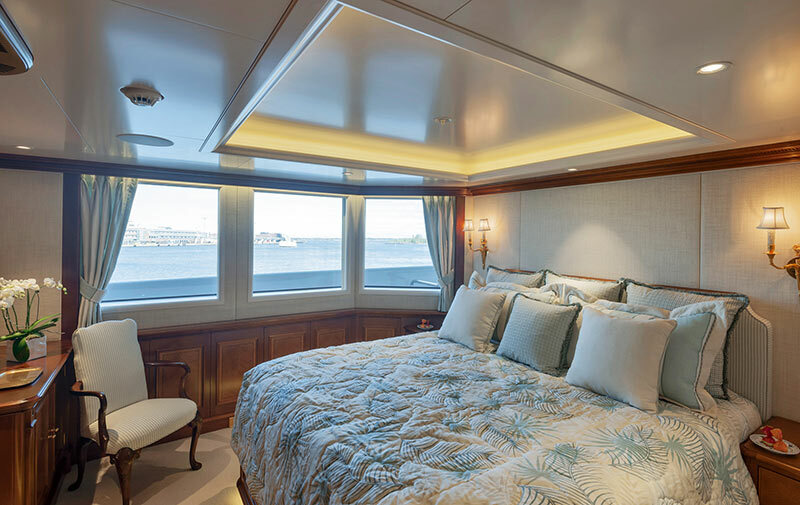 The Master suite places the king-sized bed to port with a side-terrace for fresh air and views, and to starboard, the lounge is comprised of a sofa, three armchairs and a coffee table for receiving guests. 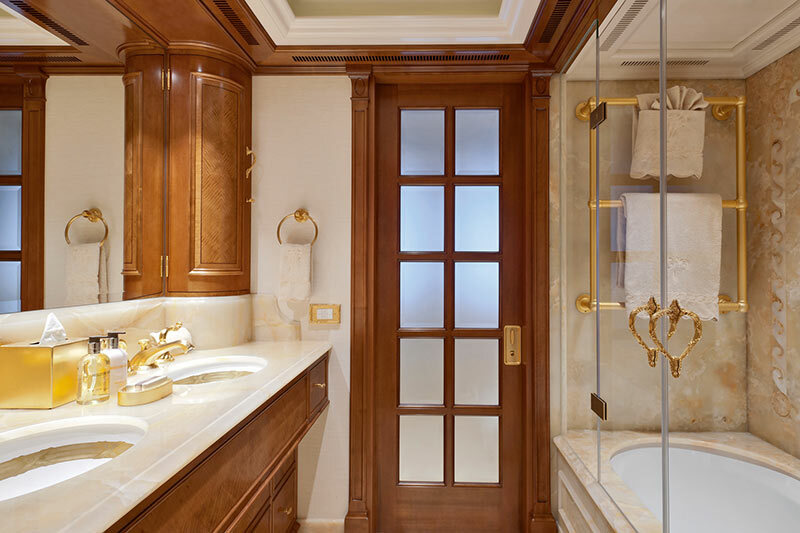 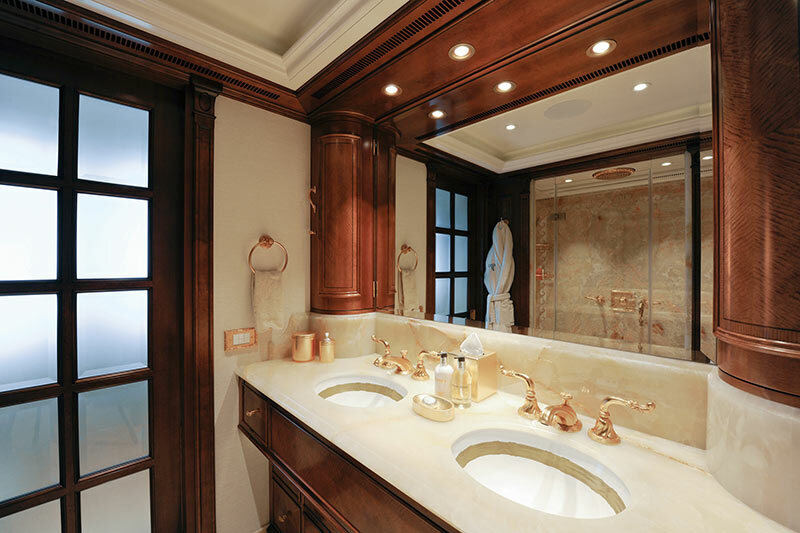 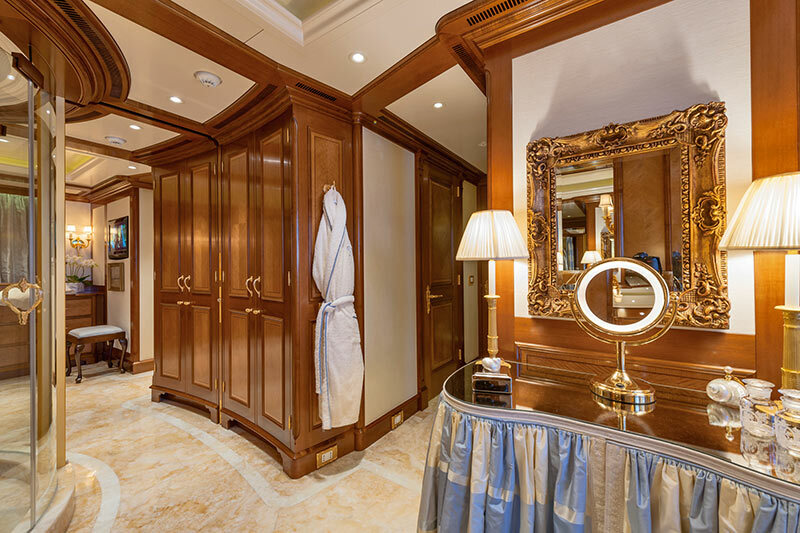 His and hers walk-in wardrobes are placed forward that feed into the en-suite bathrooms, within which there are a bathtub, shower and golden sinks. 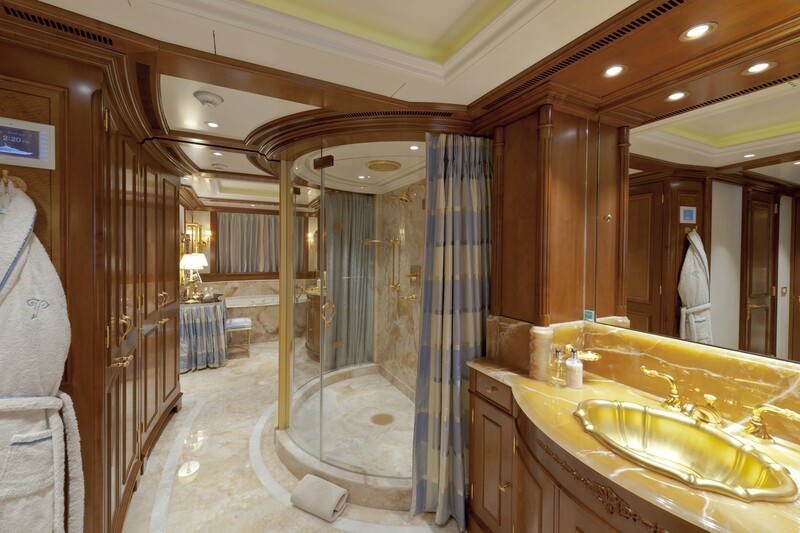 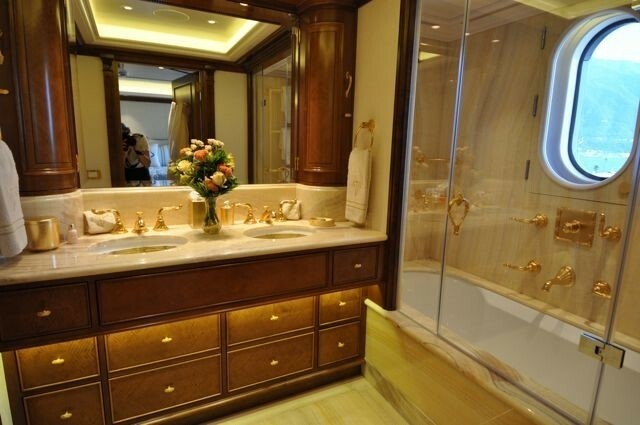 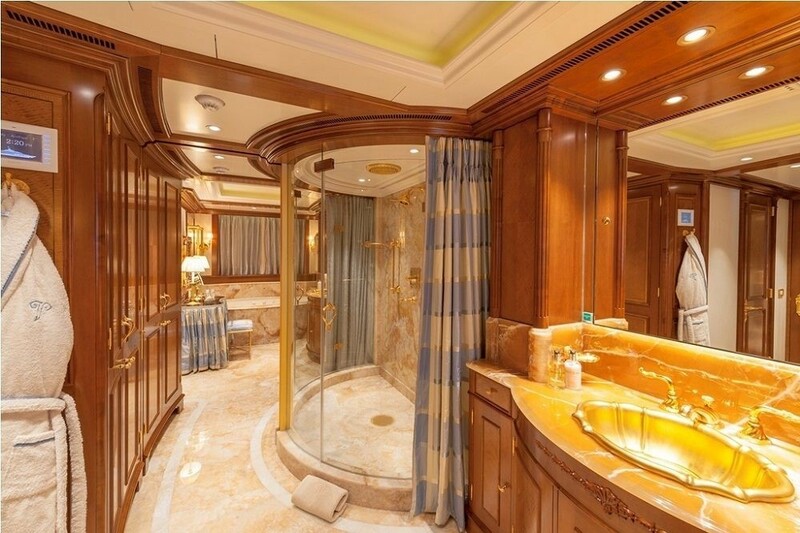 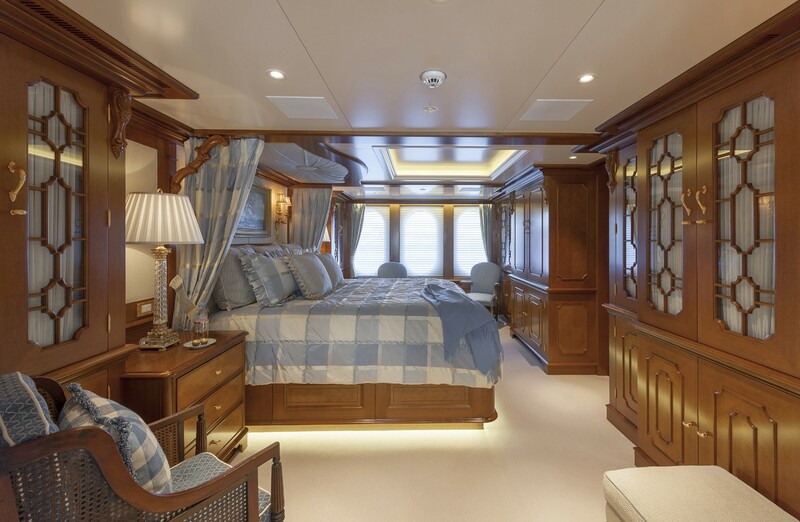 The VIP stateroom on the bridge deck has a desk and widescreen TV in the bedroom, and the aft en-suite bathroom is furnished with a bathtub, toilet and his-and-hers sinks. 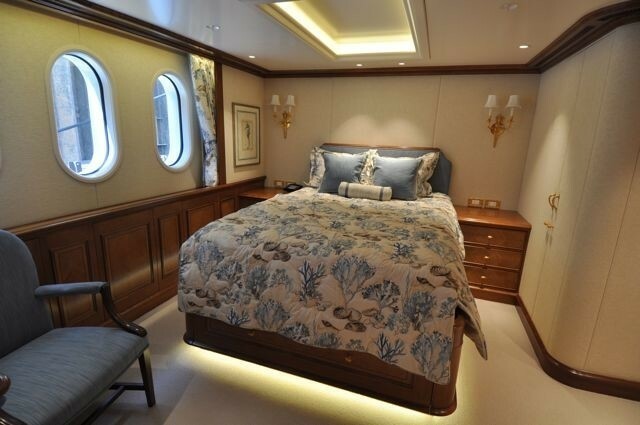 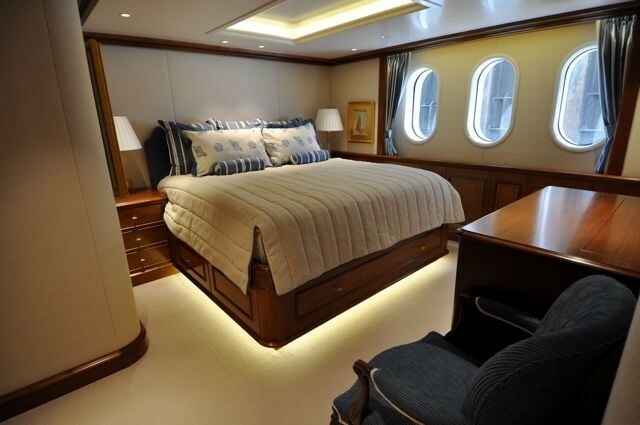 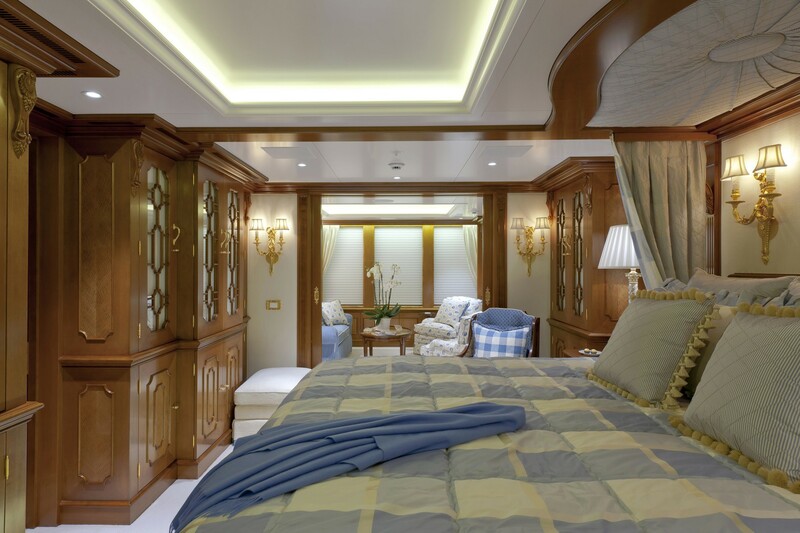 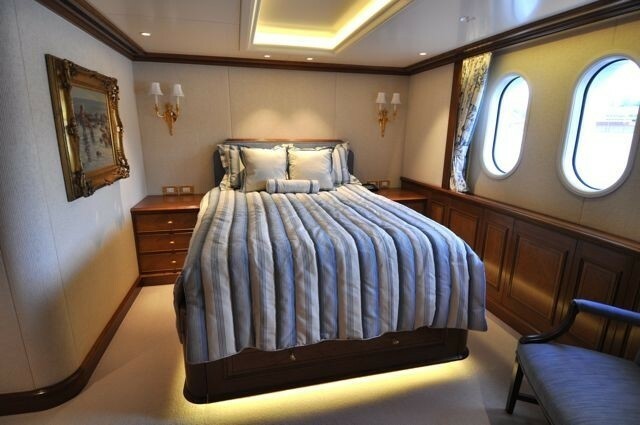 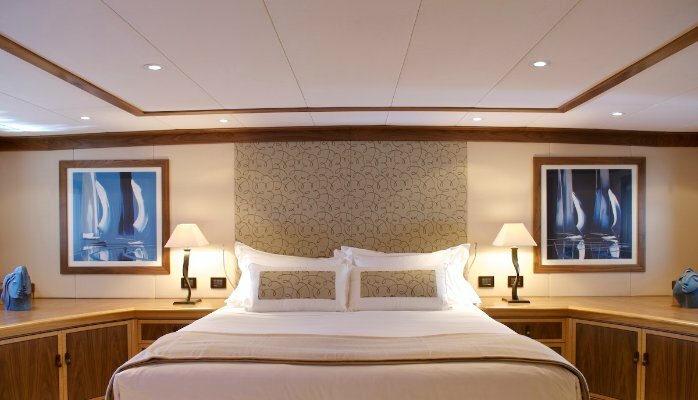 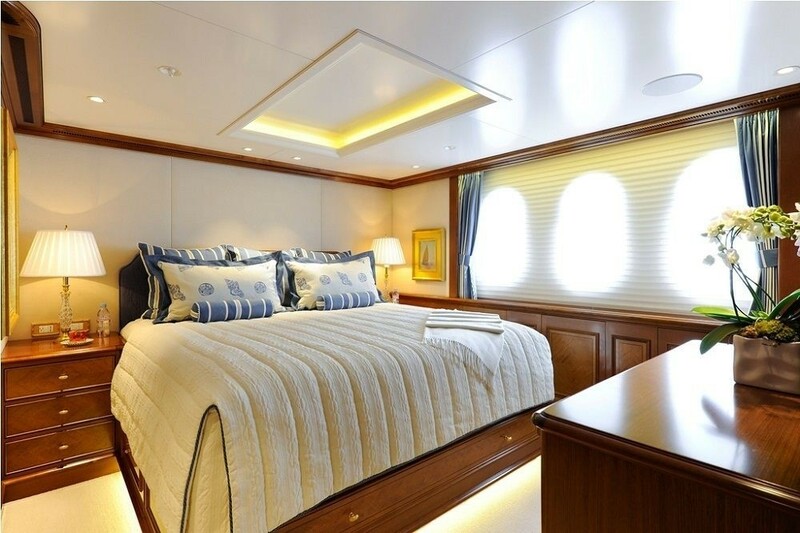 Four double guest en-suite cabins are placed on the lower deck and share a similar setup to the VIP stateroom. 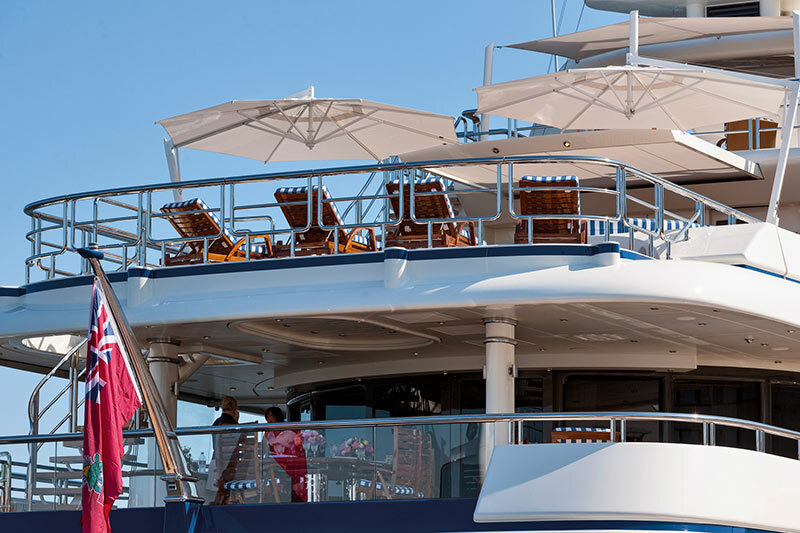 The crew of 15 will provide expert service throughout every cruise. 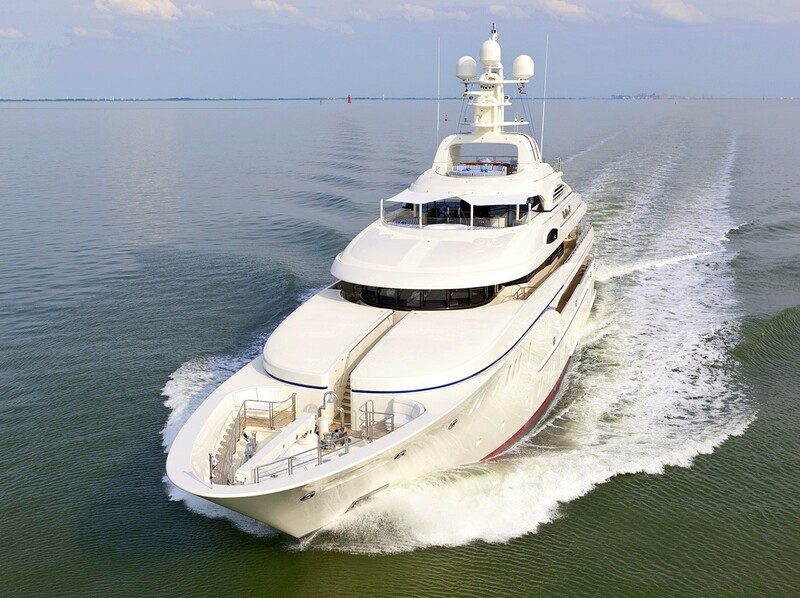 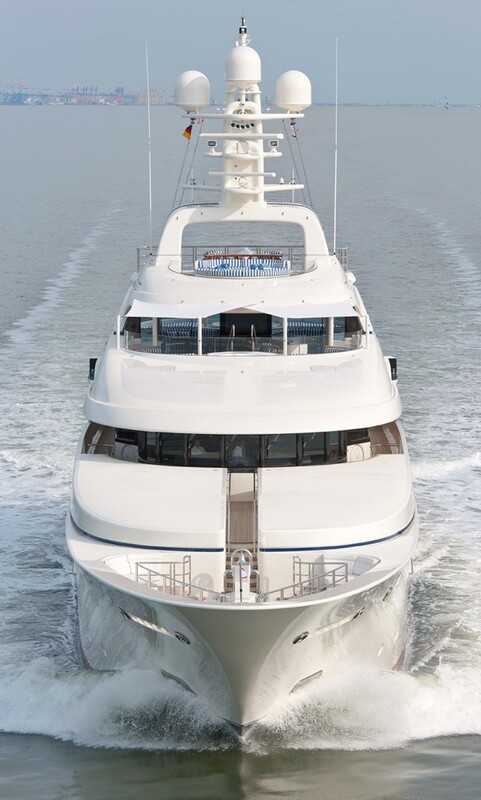 We do have available further amenity, owner and price information for the 61m (200' 2") yacht 61M FULL CUSTOM, so please enquire for more information.